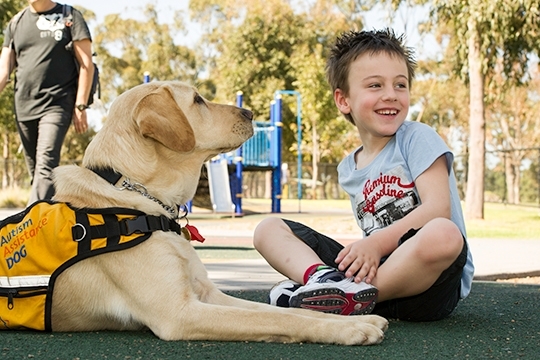 With limited NDIA funding and a constant increase in demand for our services, Guide Dogs SA/NT relies heavily on the generosity of our donors and supporters to continue changing the lives of people living with disability. By taking the Boss’ Blind Date challenge and fundraising for Guide Dogs, you will be supporting these vital services. Meet Arron and his Guide Dog, Helix. Arron began losing his sight at the age of six as a result of Uveitis, which is an inflammation of the eye and a sign of Juvenile Arthritis. Before the age of 10, Arron got cataracts in both eyes, and had his retinas detach resulting in haemorrhaging in both eyes. Arron’s illness and vision loss was traumatic. He now has no vision in his left eye and about 10% in his right. He is at risk of further retinal detachment, which would leave him completely blind. But Arron has a positive outlook on life and nothing has slowed him down. 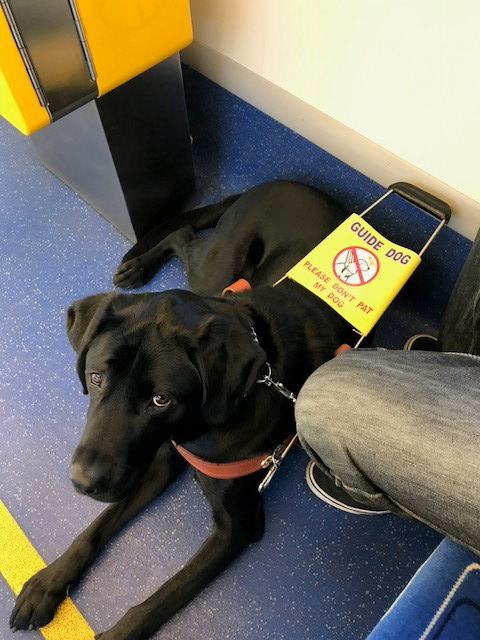 In 2017, Arron was matched with Guide Dog, Helix. “The trial walk I took with Helix was amazing. Walking felt so different – so easy!" "I immediately noticed that Helix led me safely up and along any ramps. There are places where I would normally trip on the edge of a step but with Helix, I felt really safe. As I can only see light and shade I’m always taking my sunglasses on and off to help orient myself. I didn’t take them off at all because Helix did all the hard work." Helix has given him the ability to be out at night and get around without having to rely on his friends and family. 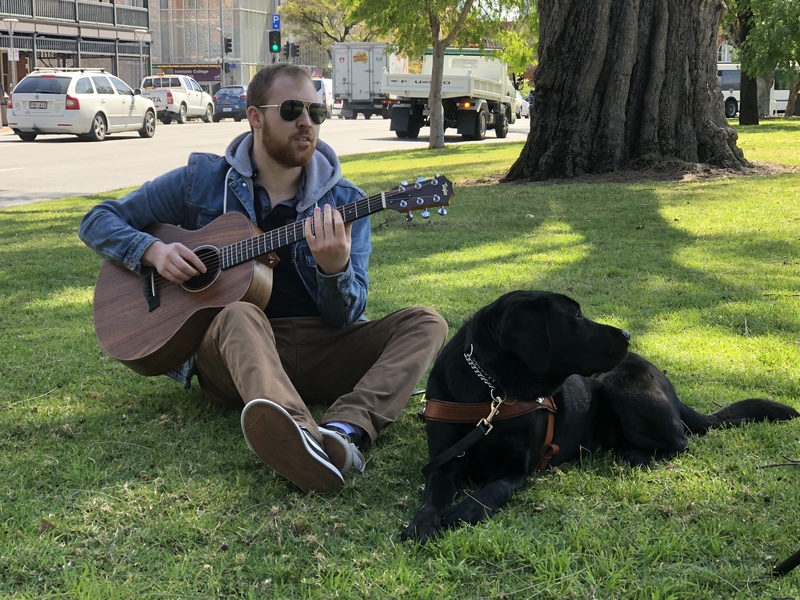 His career as a musician requires a lot of night work, so a Guide Dog is crucial for him to be able to get around. 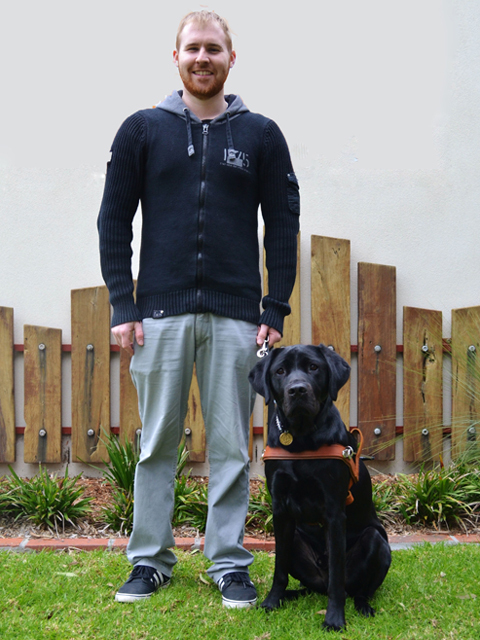 Arron recalls the first time he did a night walk with his Guide Dog, Helix. “When I did the night walk with Helix, I thought ‘Wow! I didn’t know I could do this’. That was the penny drop moment! To do something you haven’t done on your own… it was just really impressive. If I had my cane, I’d be bumping into everything. But with Helix, it frees me up so much." Having a Guide Dog provides Arron with confidence, independence and companionship. 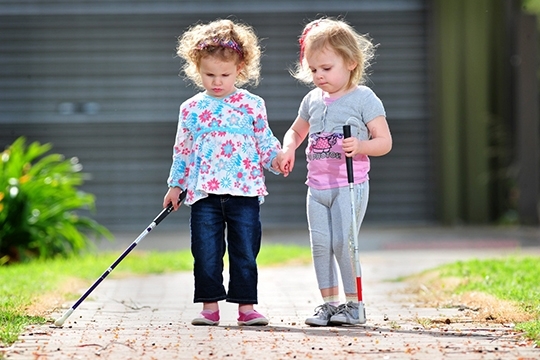 “Getting the confidence to walk out of the house and know I’m going to get everywhere safely. And then to have that companionship; it keeps me motivated." "I get around quite a bit, visiting my sister or Dad every weekend, Helix has learned all of these places and settles into five different homes just as well as one. It’s kind of cool, we’re like jolly swagmen! He’s also fantastic at gigs. As soon as I finish a song and put my guitar down he knows we’re going to go stretch our legs. Helix has some really great traits. We are a pretty good match." We asked Arron what he would say to people who are supporting Guide Dogs. He said “They are giving people who have a disability an opportunity to change their life. There are doors that are closed for people like me. Their support will open these doors". Your support will open up a world of possibilities for people just like Arron.